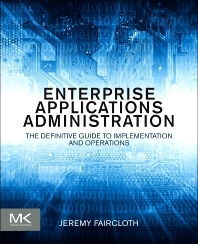 Administrators of enterprise applications, systems administrators, and database administrators. Used for high-level academic computer courses with a focus on large business systems. Jeremy Faircloth (CISSP, Security+, CCNA, MCSE, MCP+I, A+) is an IT practitioner with a background in a wide variety of technologies as well as experience managing technical teams at multiple Fortune 50 companies. He is a member of the Society for Technical Communication and frequently acts as a technical resource for other IT professionals through teaching and writing, using his expertise to help others expand their knowledge. Described as a “Renaissance man of IT” with over 20 years of real-world IT experience, he has become an expert in many areas including Web development, database administration, enterprise security, network design, large enterprise applications, and project management. Jeremy is also an author that has contributed to over a dozen technical books covering a variety of topics and teaches courses on many of those topics. (Security+, CCNA, MCSE, MCP+I, A+), Senior Principal IT Technologist, Medtronic, Inc.